The 5 Dollar Preps series is to show people that even if you don’t have a lot of extra cash you can still do a lot to get prepared. Last week we got some first aid supplies and a basic fishing kit. This week Zack got some things for gun cleaning, and I put together a small sewing kit for my Bug Out Bag. 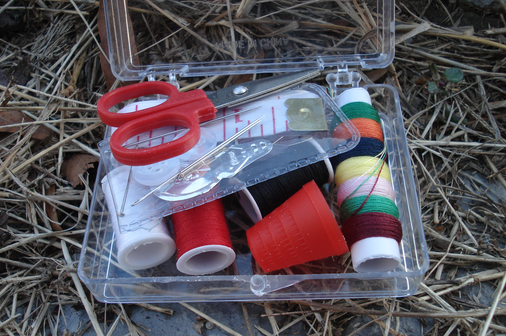 I started with a little travel sewing kit for $1.37. It came with a tiny pair of scissors which is always useful, and a thimble. It also came with several small spools of thread, which is much better for light packing than a full sized spool you will probably never need. I beefed up this little kit with two packs of needles. One variety pack of standard needles for a whopping $0.67 cents, and a pack of heavy duty needles for bigger jobs like canvas for $1.67. Finally, I found some really cool stuff called Bondex Outdoor Restore, that is basically peel and stick nylon. For $1.77 I can cut a square of this stuff and patch a tent, backpack, or jacket that would not be at all possible to sew. Not that it really matters much, but they sell it in several colors. Zack got the essentials for gun cleaning that will get used up the fastest; cotton patches and cleaning solvent. Gun cleaning supplies will get used up just like anything else but aren’t something you hear people mention often in their survival gear. The cotton patches are just a bulk pack of Winchester cotton patches that you have to cut up yourself, but for $2.97, not a bad deal. The cleaning solvent is of course, Hoppe’s No. 9. Zack got a 4 oz bottle at the store for $2.97, but I come home to find out they actually sell it by the quart online. Or if you you don’t want to keep a giant quart bottle of this rather potent stuff all in once place, Amazon has a 10 pack of 4 oz bottles for $9.79.